#TalkBD with us on Bell Let’s Talk Day! Update: Thank you for joining the #TalkBD conversation! We have collated all the questions and answers from the six-hour event here. Have questions about BD? Start a conversation with us this Wednesday on Bell Let’s Talk day! Network Lead Dr. Erin Michalak and diverse members of the CREST.BD team are taking your questions on Twitter and on Facebook from 10-4PM PST on January 30, 2019. 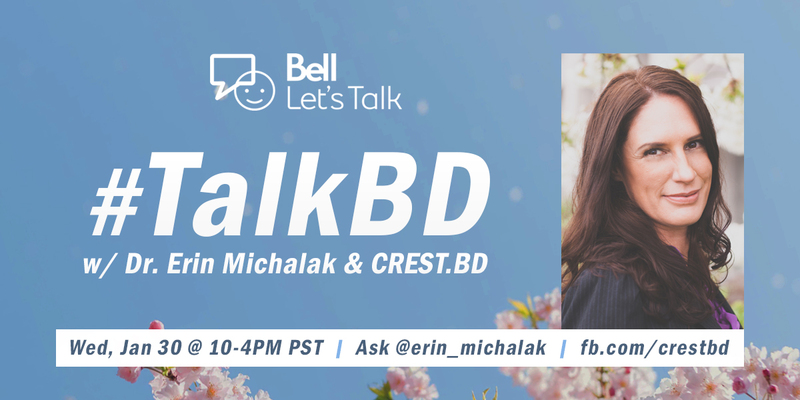 Use the hashtags #TalkBD and #BellLetsTalk, and tweet @erin_michalak. If you are on Facebook, simply post your questions on our page or reach us anonymously via private message. Bell Let’s Talk day is an annual, national, online discussion about mental health that aims to create open conversation about mental health conditions. We applaud this effort and are pleased to take part in the conversation via social media. On our Twitter and Facebook accounts, we’ll be focusing on sharing evidence-based mental health research from our own work and the great work taking place in our community leading up to January 30. The most important part of the #BellLetsTalk initiative, however, is that proceeds are donated to the Bell Community Fund, which provides grants to projects that improve access to mental health care, supports and services for people in Canada living with mental health conditions. The 2019 Bell Let’s Talk Community Fund is now open for applications. Deadline to apply is March 15, 2019. CREST.BD: Highlights from our World Bipolar Day “AMA” on Reddit! All the questions and answers from our first #TalkBD event!